Cereals are a staple of the human diet and have a significant effect on health. As a result, they are of major significance to the food industry. 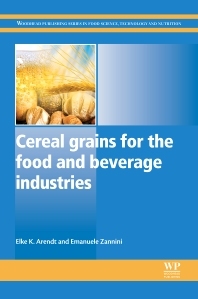 Cereal grains for the food and beverage industries provides a comprehensive overview of all of the important cereal and pseudo-cereal species, from their composition to their use in food products. The book reviews the major cereal species, starting with wheat and triticale before covering rye, barley and oats. It goes on to discuss other major species such as rice, maize, sorghum and millet, as well as pseudo-cereals such as buckwheat, quinoa and amaranth. Each chapter reviews grain structure, chemical composition (including carbohydrate and protein content), processing and applications in food and beverage products. Cereal grains for the food and beverage industries is an essential reference for academic researchers interested in the area of cereal grains and products. It is also an invaluable reference for professionals in the food and beverage industry working with cereal products, including ingredient manufacturers, food technologists, nutritionists, as well as policy-makers and health care professionals. Elke Arendt is Professor in the School of Food and Nutritional Sciences at University College Cork (UCC), Ireland. Dr Emanuele Zannini is a Senior Research Scientist at the School of Food and Nutritional Sciences at University College Cork (UCC), Ireland.